This guy is full of surprises. 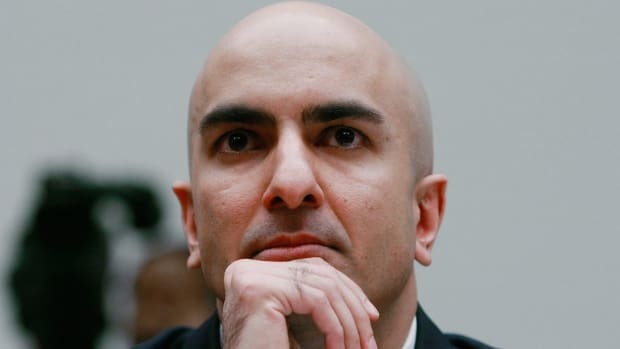 We were all pretty surprised when Neel Kashkari got a gig as president of the Federal Reserve Bank of Minneapolis. After all, we knew that Neel was a former Goldman banker turned Treasury official, and that he ran for governor of California, but we didn&apos;t know that he was an economist on any Fed Reserve shortlists. 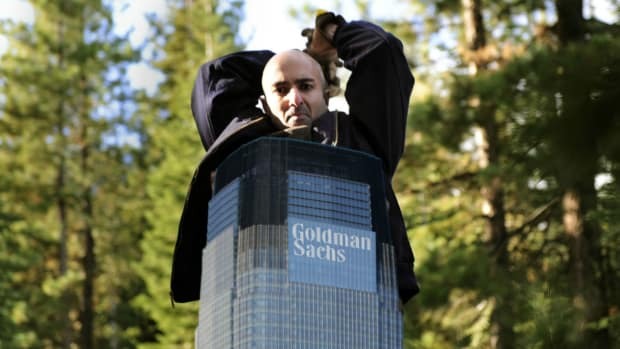 Well, Neel gave his first speech as a Fed president today, and we learned something new about him; Neel Kashkari is a Bernie Bro. In the last six years my colleagues across the Federal Reserve System have worked diligently under the reform framework Congress established and are fully utilizing the available tools under the [Dodd-Frank] Act to address TBTF. While significant progress has been made to strengthen our financial system, I believe the Act did not go far enough. I believe the biggest banks are still too big to fail and continue to pose a significant, ongoing risk to our economy. While he didn&apos;t don a white wig and glasses, Kashkari came very close to going to the Full Bern. Enough time has passed that we better understand the causes of the crisis, and yet it is still fresh in our memories. Now is the right time for Congress to consider going further than Dodd-Frank with bold, transformational solutions to solve this problem once and for all. The Federal Reserve Bank of Minneapolis is launching a major initiative to develop an actionable plan to end TBTF, and we will deliver our plan to the public by the end of the year. Ultimately Congress must decide whether such a transformational restructuring of our financial system is justified in order to mitigate the ongoing risks posed by large banks. Although TBTF banks were not the sole cause of the recent financial crisis and Great Recession, there is no question that their presence at the center of our financial system contributed significantly to the magnitude of the crisis and to the extensive damage it inflicted across the economy. Given the scale of job losses, home foreclosures, lost savings and costs to taxpayers, there is widespread agreement among elected leaders, regulators and Main Street that we must solve the problem of TBTF. We know markets make mistakes; that is unavoidable in an innovative economy. But these mistakes cannot be allowed to endanger the rest of the country. Now, Neel worked for Hank Paulson at Treasury and ran for governor as a Republican in 2014, so we know that his politics were right-leaning at some point in his life, but his running of the TARP program clearly left him with some kind of PTSD. He is walking through the smoke of a controlled burn in the Sierra Nevadas. He is talking about the people and the life he left behind in Washington…The moon hits his stubble, which is six days old. And the sweater he hasn&apos;t changed in three or four days. His BlackBerry -- he can&apos;t kick it -- rang once today. A year ago in D.C., it buzzed every few seconds. All night, he&apos;d roll over to its bluish glow. His Treasury Department assistant slept with hers, powered up, on her pillow. "It&apos;s like a dream," Kashkari says, his work boots crunching pine cones. "Sometimes I think: Was it real?" It was bad, you guys. Bad enough to go from Goldman to Bernie in less than a decade. Even with the 2008 bailouts, the costs to society from the financial crisis in terms of lost jobs, lost income and lost wealth were staggering—many trillions of dollars and devastation for millions of families. Failures of large financial institutions pose massively asymmetric risks to society that policymakers must consider. We had a choice in 2008: Spend taxpayer money to stabilize large banks, or don’t, and potentially trigger many trillions of additional costs to society. A very crude analogy is that of a nuclear reactor. The cost to society of letting a reactor melt down is astronomical. Given that cost, governments will do whatever they can to stabilize the reactor before they lose control. Using taxes to offset risk and going after TBTF by regulating them like a utility? That&apos;s one step to the right of paying for universal college tuition. Say what you will about the new president of the Minneapolis Fed, but Neel Kashkari seems like a real wild card. But he IS a rocket scientist who worked at Goldman and PIMCO...You guys get it. Our new columnist wonders if there's a goal-oriented method to Kashkari's measured madness. America's raddest central banker doesn't want to hear your capital buffer bellyaching. But can you imagine the Medium posts?